You are definitely going the purist route here. How do you plan to handle edge of the board work? I rely on my leg vise a lot for that but I don’t have a crochet. Will there be more dog holes that what you are showing in the sketch? The crochet will not hold the boards so you will need some holdfast holes under it or along the bench front. I might also recommend a few holes on the top for holdfasts when securing boards for detail work or even securing battens for planing wide boards. Otherwise, this bench is a beast and will serve you nicely. Something to consider… If you don’t follow Bob R. over at Logan Cabinet Shoppe, go look for him (link below). He is just completing a similar bench. He used a split top, leaving a half-inch gap between boards. That gap allows yet another method of workholding. Drop a 1/2 inch vertically into the gap, then push stuff against it. Of course, that bench design depends on some sort of structure under the top. Thanks, Bob, for that link. I hadn’t watched Bob’s videos before; he does a great job and his videos are quite interesting. Yeah I think that the gap in the middle is intriguing but definitely wouldn’t work for the Roubo/Moxon-style bench that has no “undercarriage” to speak of. I’ll just have to content myself with battens held by holdfasts to do the same thing! How do you feel about adding an additional planing stop — for extra flexibility (i.e., for wide boards)? Yep – I’m also tending towards no bench vises. Holding work when edge-planing: Iit seems that as long as you have something to support your workpiece vertically, it seems like the interior shape of the crotchet should wedge it upright. Using my sawhorse-workbench, I’ve just been using regular C-clamps to hold a long 1″ x 4″ horizontally across the two front legs. It would be easier to adjust the positioning if I had a series of holes (with suitably-sized dowels) — but I haven’t got around to that, yet. Hmm, a second planing stop. That’s an idea. I have thought of something similar: making round bench dogs to go in my holdfast holes. Then I’d have a half dozen planing stops! I’ll send pics if you like. I just posted on a woodnet discussion about going vise-less on a Nicholson type bench, just a crochet and a couple of holdfasts, and the crack up the middle. You can see my bench on my blog at schoolofwood.com. Thanks Mike – that is a very practical design, I love it! You can rarely go wrong with a simple plan. However I would be careful of one thing on this design. Using through tenons on the front and back will leave no room for wood movement increasing the risk that your top will split when it shrinks (not to mention work your tenons loose on the base). Instead I would use the through tenons on the front, locking it flush with the legs and use sliding dovetails (not glued) in the back. This way when the top moves no one will ever be the wiser. People worked a long time without vises and did great work in the process. That being said I love my vise and could not work without it. What type of work do you plan on doing on this bench? Is this your first bench? How are you planing on building it? Hey Ryan, thanks for your input! As to wood movement, I have two thoughts: 1) In Malaysia where it is hot and humid all year round, will I really have a wood movement issue? I suppose during the rainy season it is slightly more humid (if that’s possible! ), but I’m not sure. I’ve asked this question in a few different place a few different times, and have not really heard an answer to that question. I think most woodworkers do not live in this type of climate so don’t know from experience! And 2) Chris Schwarz mentions that the wood movement in a bench design like this actually works in favor of the bench. He found with his Roubo that the top did shrink, and pulled the tenons in so that the legs from the side form a very very slight “A-frame” shape. But he said that this provides extra stability to the joints and does not interfere with any actual woodworking. As to the type of woodworking I plan to do, I don’t really have a set type – just all-around furniture/projects making. With hand tools only, I expect I’ll need to do a lot of planing on this sucker as well. And yes, it’s my first “real” bench, though I’ve build a work surface (as I’ll call it) before, and modified a set of counters once for working wood. Ryan raises a good point re: wood movement. If it splits, it splits. As long as it holds together, and stays sturdy. If you have constant humidity, then wood movement is less of an issue. I just always try to consider it in a piece that is likely to outlast me. Drawbore everything nice and tight and you should not have any issues. I to am a hand tool only user (addicting isn’t it) and I just built my first “real” bench, nothing fancy (see for yourself http://www.facebook.com/#!/album.php?aid=218043&id=539370228), but it works great. 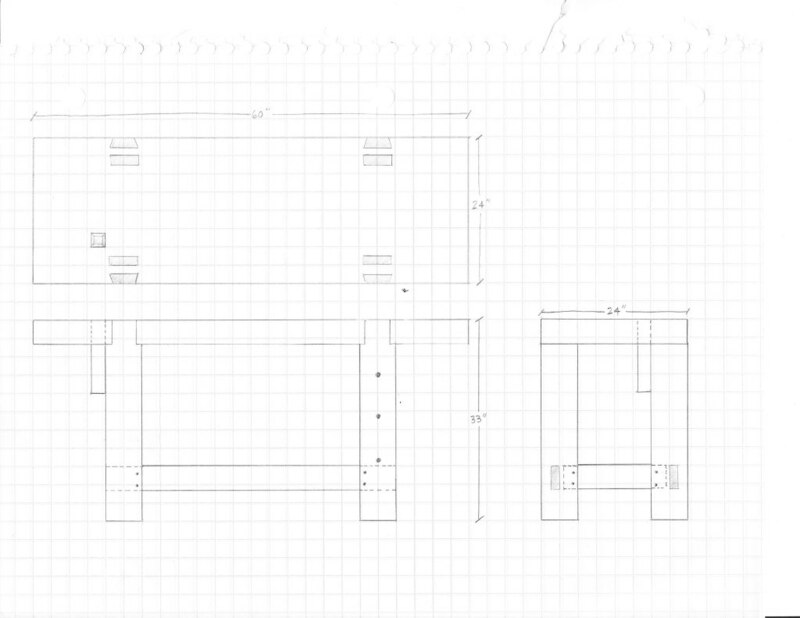 The advice I rendered is merely a few of my design thoughts on how I will build my next bench (if I ever decide to get around to it). Without a vise how are you planing to cut dovetails (or any end grain operation), just curious. A bench may or may not need a vise, but I will say for certain what it does not need…a tool well. PS I saw your “most pathetic workbench” entry…impressive what you can accomplish with a little ingenuity. Hey Ryan, thanks for your thoughts on that. Yes, I do plan on drawboring and also don’t plan on gluing anything. As to your question about the vise, I think I am going to install a leg vise but also will be making a double-screw vise that will mount to the benchtop. Haven’t decided yet if I will tap holes in the front of the bench for the double screws, in case I wanted another option, but I think the benchtop vise will really help as it will elevate the work for more comfortable dovetailing. It rubbed me the wrong way, I can’t say why – maybe all those dogholes? If I regret it, I’ll retrofit it like The Schwarz did. I’m still up in the air about the leg vise. I can retrofit that too, although it’s a bit harder perhaps.